Plus will the kids just swivel the heck out of those until they make divots in my nice black table? I’m surprisingly feeling more contemporary in my tastes as of late and so decided to mix up my dining room a bit. 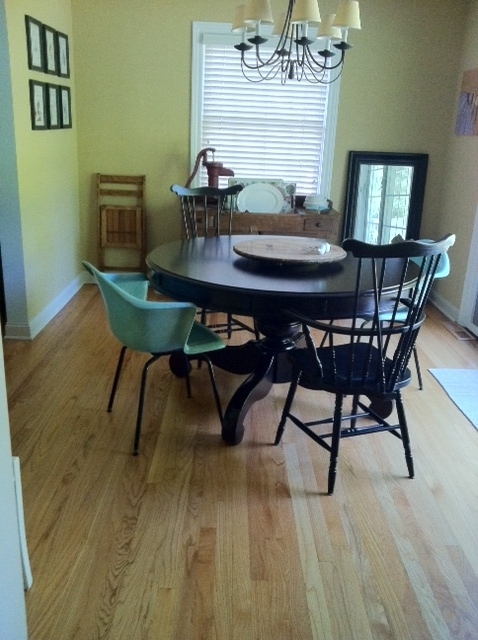 I have two of these Eames-style chairs. I bought them on a whim at an Antiques Fair in Iowa about five years ago. They were $15 a piece. A smokin’ deal, I know! Anyway, one has been in my dressing room as the Quiet Chair in the corner (which just means more space to throw clothes) and one in my six-year-old daughter’s room (she’s quickly learning the quiet-chair-turned-clothes-storage space as well). I love my black spindle chairs but they are kinda crappy (read: some of the tops come off when you try to move them or the spindles pop out). Anyway, I’m just trying this . . . I painted the adjoining living room Robin’s Egg Blue last year, so that color works ok, but I seriously don’t know about the style. I think I'll ask for a good camera for my b-day. These photos aren't so good. They would be working a lot better if there were four instead of two, right? Should I do four different chairs? Too much, right? Any advice/feedback is truly appreciated. And I apologize for my photography . . . I don’t have the lighting thing down quite yet (never mind I’m shooting with my iPhone). Thanks! 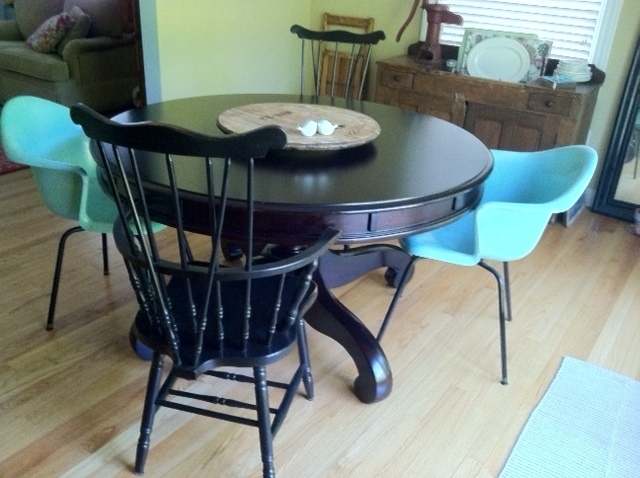 I like the Windsor chairs and black table but maybe paint them the turquoise.